Two junior doctors treating two swine flu patients in North Bengal Medical College and Hospital have complained of fever and have been isolated. Siliguri MLA Rudranath Bhattacharya, while speaking about swine flu combating facilities, said the doctors were not wearing masks or gloves as they did not suspect the two teenagers to be suffering from swine flu. Hospital sources said Bhattacharya was told about this at the meeting he held with health officials and doctors at NBMCH today. The doctors monitoring the condition of the two juniors said the duo had been kept in a separate room and taken off duty, but they have not been put in the isolation ward, pending the reports of the tests.The doctors' swab samples have been sent to National Institute of Cholera & Enteric Diseases (NICED) in Calcutta for tests to see if the two have contracted swine flu. So far, the two 19-year-old youths from Assam who stay in Siliguri have been diagnosed with swine flu. The confirmation that the two teenagers, Anuj Saikia and Sukhopa Hendrik, had swine flu was announced yesterday. They have been kept in the five-bed isolation ward. The junior doctors have not been put in this ward, keeping in mind that they could contract the H1N1 virus, if they are free of swine flu right now. In the two district hospitals in Siliguri and Jalpaiguri, two isolation wards were opened today anticipating more cases of swine flu. Over 50 people have tested positive for swine flu across the state, two-thirds of which are in Calcutta. Swine flu patients have to be kept in isolation as the infection spreads by air. It affects the upper respiratory system and is accompanied by symptoms like high fever, cough, fatigue, headache, body ache, sore throat, runny nose, breathlessness and loss of appetite. NICED is the only facility in eastern India where swine flu tests are conducted. The state government had announced that a detection centre would be set up in north Bengal. But health department officials here said they would not be able to set up laboratories at NBMCH and School of Tropical Medicine in Calcutta soon for testing swine flu immediately. Reports of swab samples of the two persons fsrom Golaghat district in Assam which were received by NBMCH officials from NICED through email yesterday had confirmed H1N1 virus. The two persons were working as salespersons in Siliguri and are now in the five-bed isolation ward at NBMCH. They were residing with around 15 to 20 other people from Golaghat at a rented accommodation in Matigara, sources said. A team of Darjeeling district health officials have already visited the area to check if there are more people with fever and or influenza-like symptoms, both indications of swine flu. Bhattacharya, the Siliguri MLA and chairman of Assembly's standing committee on health, today held a meeting at NBMCH with health officials of Darjeeling and Jalpaiguri districts, NBMCH officials, doctors of the microbiology department and nursing staff at NBMCH. "The meeting was conducted to assess the preparedness of the two districts in tackling swine flu in case the disease spreads in north Bengal. As an anticipatory measure, isolation wards have been opened in the district hospitals of Jalpaiguri and Siliguri," said Bhattacharya. "At NBMCH, too, we will augment the current bed strength at the isolation ward from five to 15 if the need arises. All the necessary items like protective gears for doctors and nurses, medicines, transport for collecting the swab samples and sterilisers are available in adequate numbers. Asked about the two doctors who were suffering from fever, Bhattacharya said: "It wasn't expected that the reports of the two patients would come positive for H1N1, so the two doctors had been treating them without wearing protective gear and masks. They are suffering from fever and cold and have been kept in isolation." 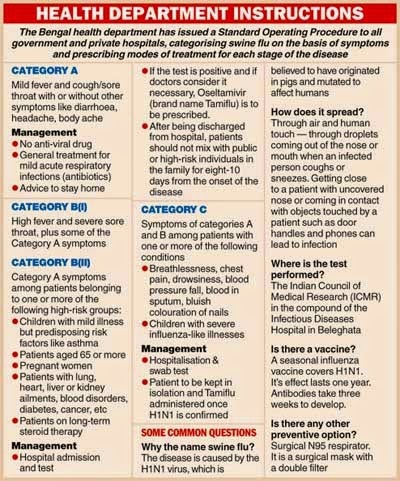 Biswaranjan Sathpathy, the director of health services of the state, said: "For now, swab samples of patients with suspected swine flu will be sent to NICED, the only lab in entire eastern India to conduct swine flu tests. We are planning to set up two labs at NBMCH and the School of Tropical Medicines but that will take four to six months."